EMSS 1358+6245: A cluster of galaxies 4 billion light years distant in the constellation Draco. 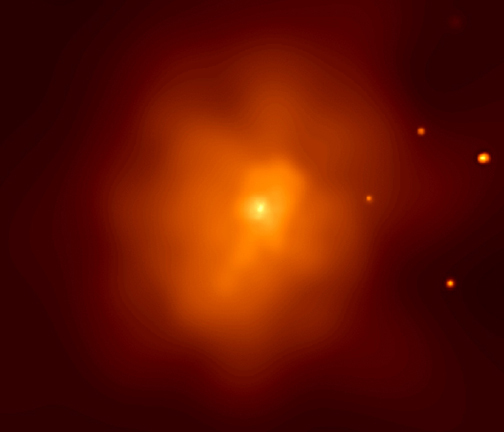 Caption: Using Chandra's image and spectrum of this distant galaxy cluster, scientists were able to determine the mass and the distribution of the dark matter in the cluster. They found that the dark matter mass is about 4 times that of normal matter, and the relative percentage of dark matter increases toward the center of the cluster. These precise measurements of the increase of dark matter toward the center of the cluster make it possible to set limits on the rate at which the dark matter particles collide with each other in the cluster. Such information will allow scientists to better determine the nature of dark matter, which is thought to be the most common form of matter in the universe. Scale: Image is 3.8 arcmin on a side.